Taiwan-born delegate of 19th CCP Congress, Lu Li'an. Chinese state-owned Xinhua photo. Mainland China and Taiwan have a rocky relationship. Taiwan is a de facto political entity that has operated independently from mainland China since 1949, when the Kuomintang forces were defeated by the Communists in the civil war and retreated to Taiwan. Beijing has never recognized Taiwan's independent status and vows to one day “reunite” China and reclaim the territory. So at first glance, it might seem unusual that Beijing arranges for Taiwan representatives to attend the National Congress of the Chinese Communist Party (CCP) every five years. However, the presence of Taiwan delegates at the event is intended as a political demonstration of Beijing's “one China” principle. In the past, these so-called Taiwan representatives were born in mainland China. In a break with tradition, the chosen Taiwan delegate at the 19th National Congress held in October 2017, Lu Li'an, was actually born and educated in Taiwan — before she went to China to work as a professor. Nevertheless, many Taiwanese saw her participation as inane, given that Taiwan is not ruled by China, and a political move meant to pressure Taiwan into accepting Beijing's understanding of the “one China” principle and suppressing the pro-independence movements in Taiwan. Since Taiwan has been colonized by different countries throughout its history, Taiwanese defectors are not unheard of. Lu is not the first person (and will not be the last one) leveraged like this. Yifu Lin, for example, who served as the chief economist and senior vice president of the World Bank from 2008 to 2012, swam to mainland China in 1979 when he was a military officer in Taiwan. While Lu's presence at the CCP's National Congress was largely considered a joke in Taiwan, it did touch on the the serious issue of nationality for Taiwanese working in China. Taiwanese law prohibits Taiwanese from establishing a residence or holding a Chinese passport, or taking positions in the CCP, the Chinese People’s Liberation Army, or the Chinese civil service. 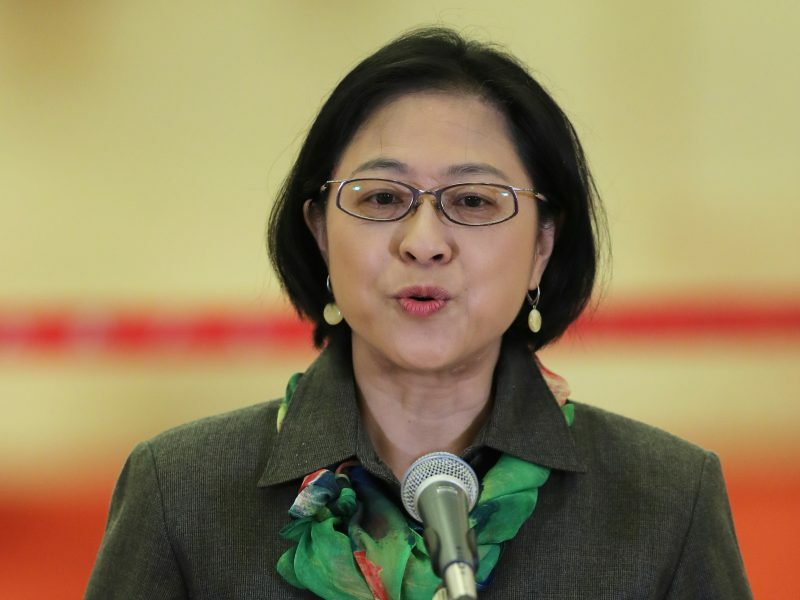 Given that Lu holds a Chinese passport and became a delegate at the CCP's National Congress, the Taiwan government decided to revoke her citizenship. At the same time, Taiwan's National Security Bureau also announced that they will examine the status of another 19 Taiwanese who have taken positions in the CCP or the People's Liberation Army. ‘If you upset Taiwanese before you join the [CCP], what use are you'? To further fire up the discussions in Taiwan, two Taiwanese graduate students from Beijing University publicly declared that they wanted to join the CCP not long after the National Congress. One of them did so in a letter published on Guancha, an online news and comments aggregator. In it, he claimed that he wants to join the CCP because speech freedom is limited, thought is monopolized, and democracy is controlled by a few people in Taiwan. The student's letter was widely condemned in Taiwan, given that Taiwan is ranked 45 and China is ranked 176 in 2017 World Press Freedom Index and Taiwanese voted to choose their president and legislators directly. Please notice that [Lu Li'an] did not apply to be a delegate. It is Sha Hailin, the director of the United Front Work Department in Shanghai, who introduced her for this position. To be chosen as an example for this position, her outlook and communication skills are seriously evaluated. Regarding those two Taiwanese students who claimed to join the Chinese Communist Party, aside from their background, their outlook and communication skills are too far below the standard. Do they think that the Communist Party would like you only because you say good things about it? Wrong answer! […] If you upset Taiwanese before you join the Chinese Communist Party, what use are you to their United Front? The United Front Work Department is one of five departments directly under the CCP's Central Committee which orchestrates soft power policies at home and abroad. It has a bureau that works on the “one country, two systems” political relationship between China and the special administrative regions of Hong Kong and Macao, and recruits the pro-China Taiwanese. When they say they are selling Taiwan, it is actually Taiwan’s independence movement on sale. When the pro-independence movement in Taiwan becomes stronger, Beijing will pay more and more to build up a united front in Taiwan. Putting border politics aside, the controversy surrounding Lu has put many Taiwanese in a difficult situation. While neither Taiwan nor China allows dual citizenship, quite a number of Taiwanese working in mainland China or couples married across the Taiwan Strait have attained citizenship in China. If they are forced to choose between the two, they must either give up their work in mainland China or conform to Chinese patriotic sentiment, which expects a person to love the country more than their homeland. After Tsai Ing-Wen, who is the leader of Taiwan's pro-independence party, won the presidential election in 2016, Beijing cut off diplomatic dialogue with the Taiwanese government and pressured other countries to end their relations. On the other hand, China's United Front Work Department has tried very hard to win support from elites in Taiwan. Recently, China's Fujian Province claimed to open 1,000 positions in universities for Taiwanese academics to apply. To apply or not to apply for the positions — the choice will be both personal and political.